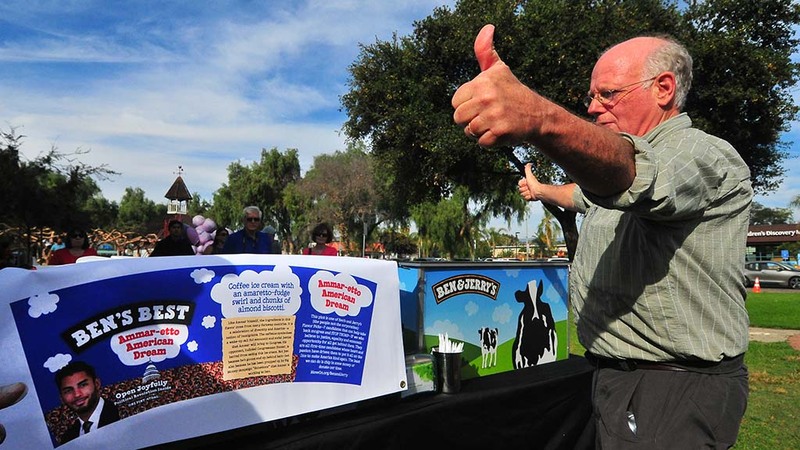 Ben Cohen of famous Ben & Jerry’s Ice Cream scooped out free servings of his frozen treat Sunday, sprinkled with reasons why President Trump’s agenda should be stopped. 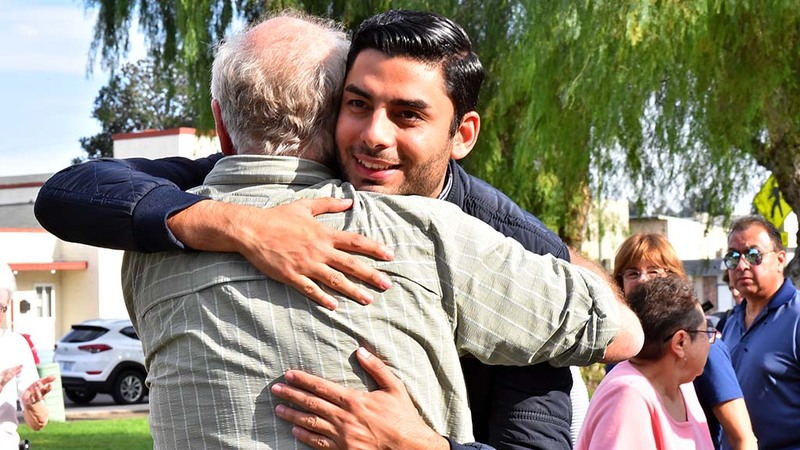 Campaigning for Democrat Ammar Campa-Najjar in Escondido’s Grape Day Park, Cohen laid out his recipe for helping first-time progressive candidates who he thinks have a chance to win in GOP districts. 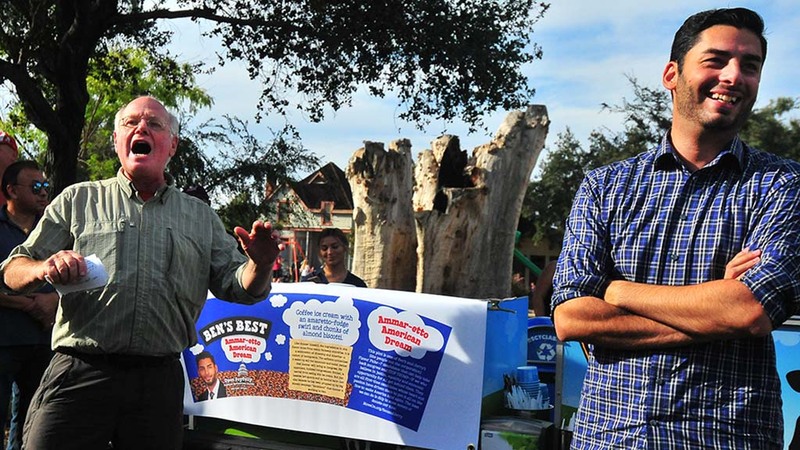 “We need to find some way to stop Trump, and the only way to do it is to turn Congress from red to blue,” said the 67-year-old businessman two days after fellow Vermonter Bernie Sanders came to the county (for a Mike Levin rally). 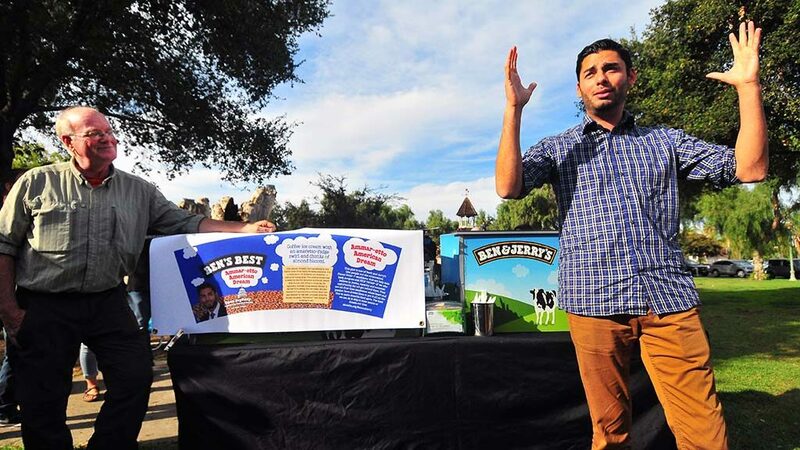 On their own, they developed ice cream flavors for Campa-Najjar — Ammar-etto American Dream — and the six other House hopefuls. Later the pair will raffle off the treats as a fund-raiser. 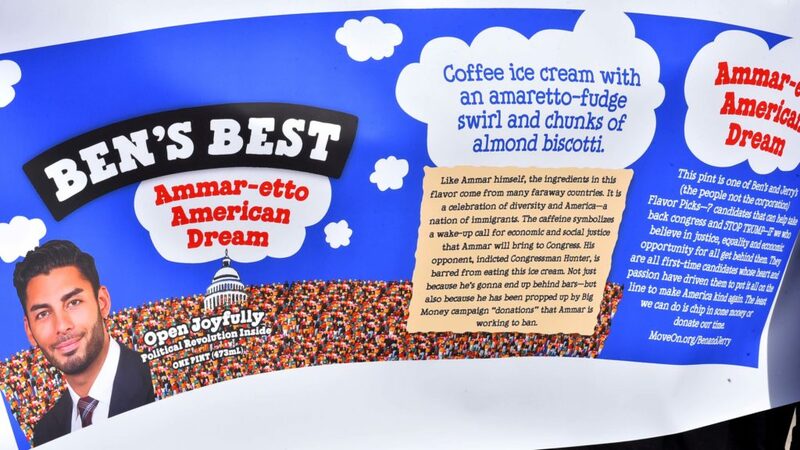 Campa-Najjar’s custom blend has biscotti from Italy, coffee from Mexico and amaretto fudge swirl “from wherever the heck amaretto comes from,” Cohen told Times of San Diego. 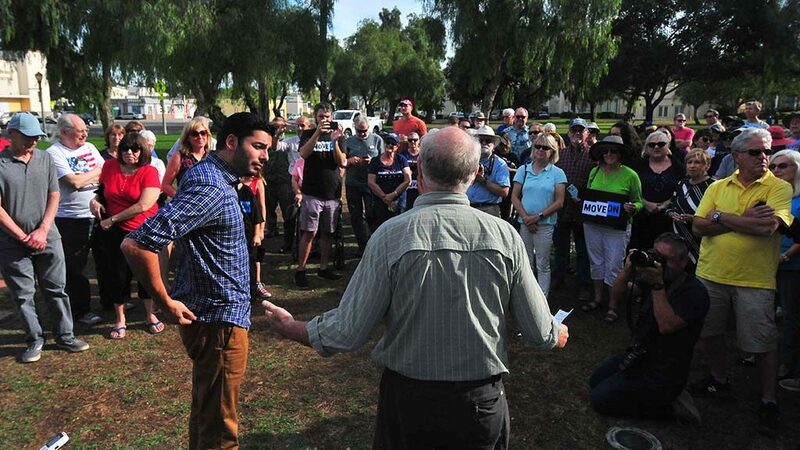 Cohen’s stop in Escondido, in association with MoveOn, was his last of the campaign. 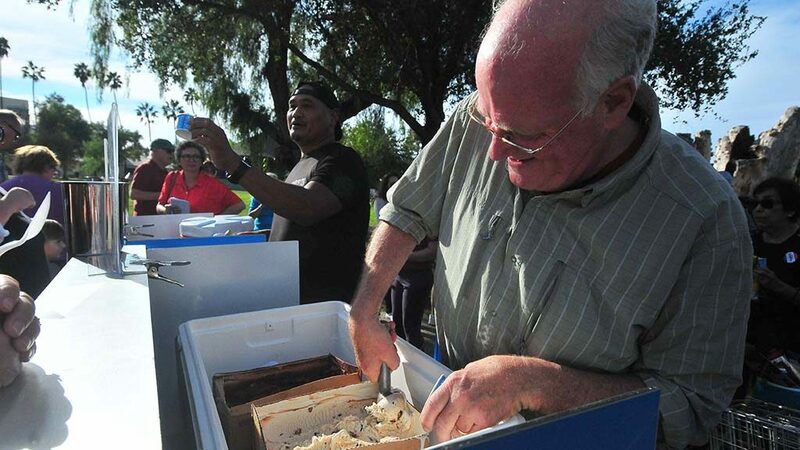 Now he’s headed home to churn up 40 pints in his home freezer for each candidate. “Hopefully, we can shine a national light on this race,” he said on a warm day. 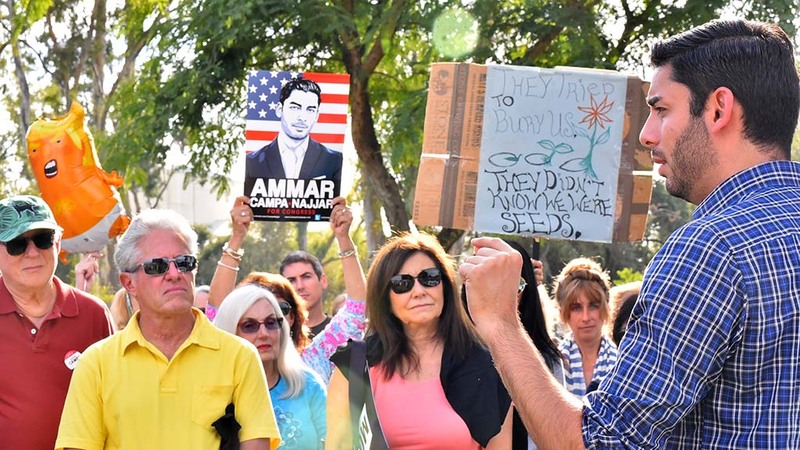 Cohen and Campa-Najjar hadn’t met earlier but together urged the crowd of about 75 people to vote next week. Campa-Najjar predicted that his race may be the last one called nationally because of the time zone and tightness. Campa-Najjar hurried from one event to the next Sunday with the election nine days away. But he turned his attention to Saturday’s killing of 11 people at a Pittsburgh synagogue. 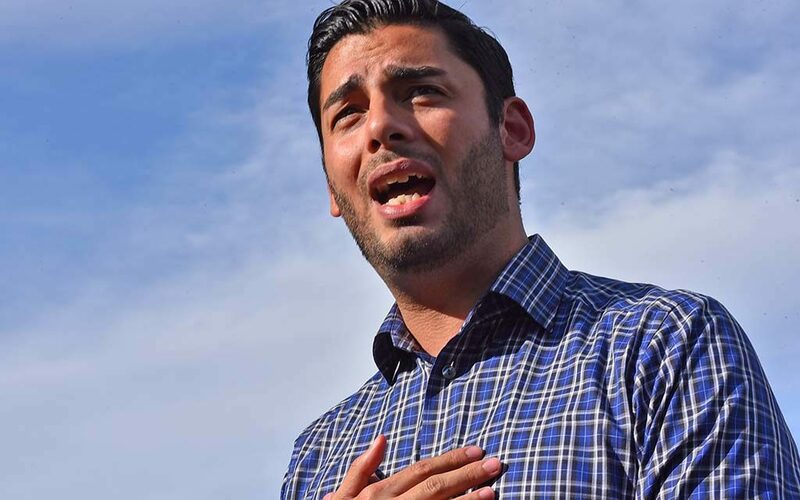 Campa-Najjar had released a statement, expressing his sadness and horror over the tragedy. 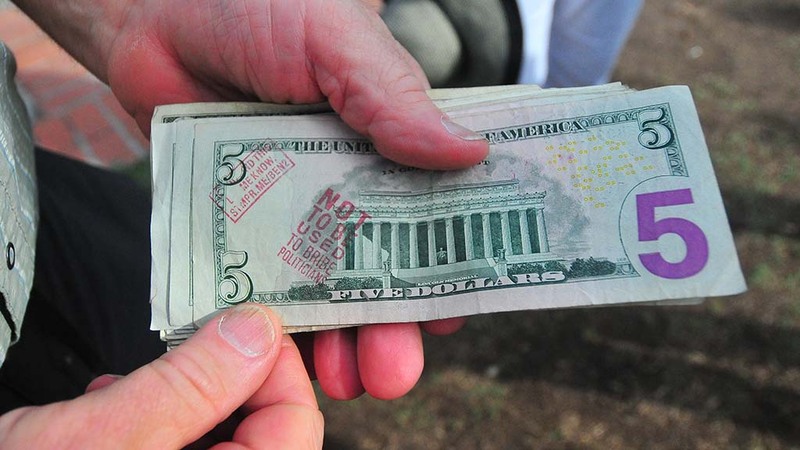 “Congressman Hunter said nothing about this. Not even condolence. Nothing,” he said in a brief interview Sunday. “That highlights our contrast in this district. Cohen had strong words for Trump and Saturday’s attack. Cohen says the president doesn’t condemn white supremacists. 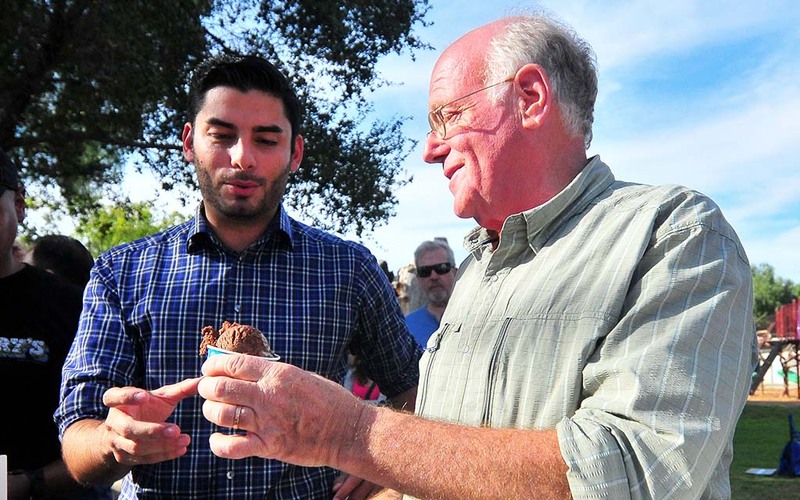 Campa-Najjar, after his speech to volunteers and supporters, looked around for the free scoops of Chocolate Fudge Brownie, Stephen Colbert’s AmeriCone Dream and Cherry Garcia. “I’m fired up and need to cool down,” said the former aide to President Obama. He chose the fudge brownie. 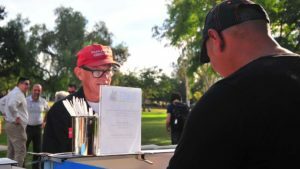 Two supporters of President Trump arrived late to the event, garnered a scoop of ice cream. They ate under a tree before leaving. Sean Colgan of Oceanside, one of the Trump fans, requested Stephen Colbert’s AmeriCone Dream, although he might like the ice cream more than he agrees with the late-night host’s opinions. 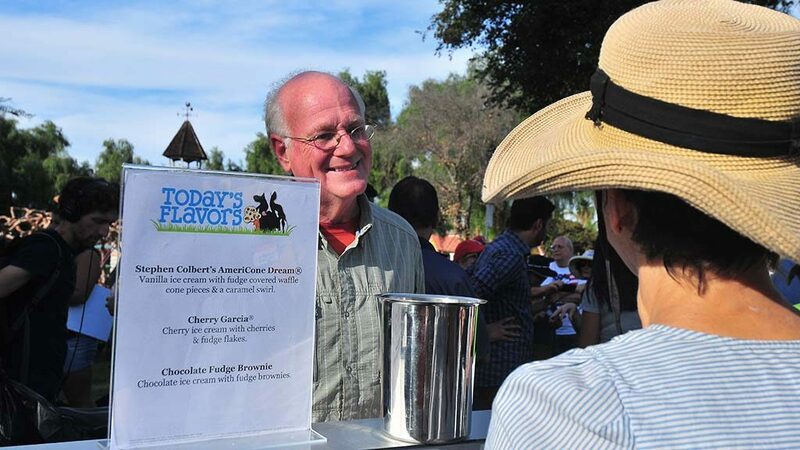 Cohen lingered in the park, talking until most people left and then helped a local Ben & Jerry’s employee take the remaining ice cream back to the truck. 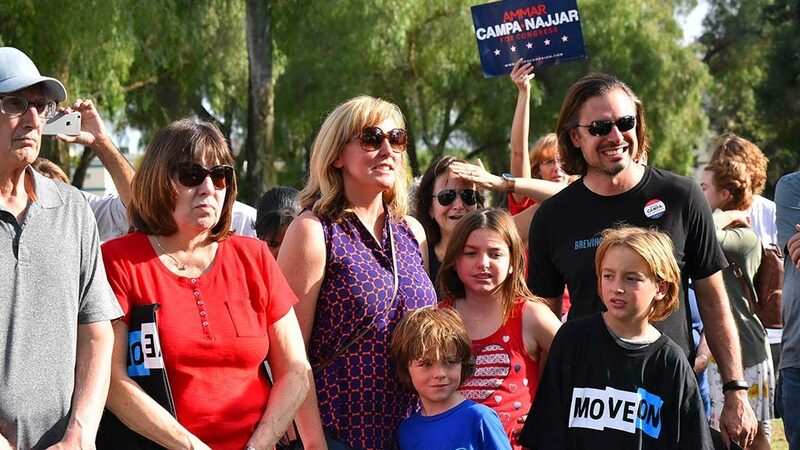 Campa-Najjar mentioned the heat of the day and long hours his volunteers have donated.